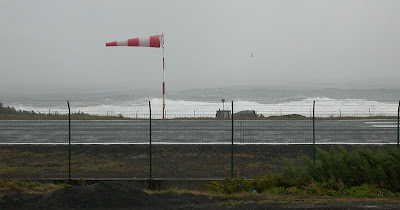 Birding Corvo 2009: REALLY crazy winds! Go to http://www.youtube.com/user/Waderwatcher and click on the links to the right. Good stuff - WATCH IT! Today was a relax day for me. Had a really good nights sleep, continued with a 1½ hour long breakfast with loads of coffee and finally finished my chill with a few hours computer work so now I have almost cought up with my harvest of emails. The winds was super ultra mega strong today so birding was very difficult, accept deep in the valleys on the sheltered eastern side of the island. Took a walk with Vincent around the village during late afternoon and managed to see a Yellow-billed Cuckoo despite the wind. Continued down to the western shore to have a look at the great scenery with the waves crashing against the lava beaches. Very impressive stuff! 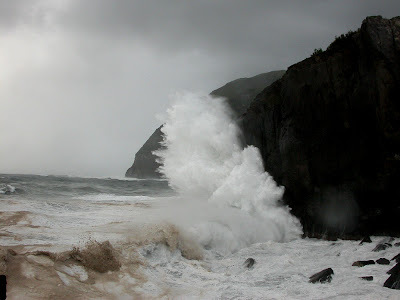 A big wave hitting Corvo. The water is splashing about 50 m up in the air! Vincent spotted a young White-rumped Sand with the Turnstones on the airfield and we watched it together for an hour or so. All the waders had some difficulties moving in the very strong wind. Tomorrow I'll get back to work in the valleys after this much needed rest! If anybody deserves a day off it is you Olof - next week shud be gud after the gales - good hunting ! Jag hoppas att du fryser lille påg. Gissa vem? Någon i släkten som är lite skadeglad.